Throughout its history, the League has helped craftspeople sell their work, hone their skills, and generate income. More than 750 juried craftspeople produce exceptional contemporary and traditional craft in a wide range of media from Baskets and Pottery to Printmaking and Wood, from Jewelry and Quilts to Photography and Folk Art. While there are galleries throughout NH, the staff at Headquarters are responsible for the management of its membership. As websites age, content and menus tend to expand beyond what is usable. Supported by a small staff and many volunteers the website did not lend itself to easy updates. Juried Member data is kept in an in-house database but needed to be displayed on the website. They needed a succinct solution that would display the Juried Members, classes, events, and exhibits for all the galleries across the state. These were just a few of the issues faced by the staff at the League. They needed a clean design where visitors focus on the Juried members and their art but could still find all the answers they needed. It was important to ensure the website would be easy to navigate from all types of devices and offered good accessibility features. Close attention was paid to readability and user interaction on the site. We also needed to ensure that this new website would serve the League for many years and that their small staff of employees and volunteers would be able to easily make the updates they needed. Sullivan Creative provided a design that allowed for easy consumption of information about the Juried Members, Events and the Grodin Permanent Collection. We built a custom-themed WordPress website that integrated with the League’s in-house Juried Member’s database. 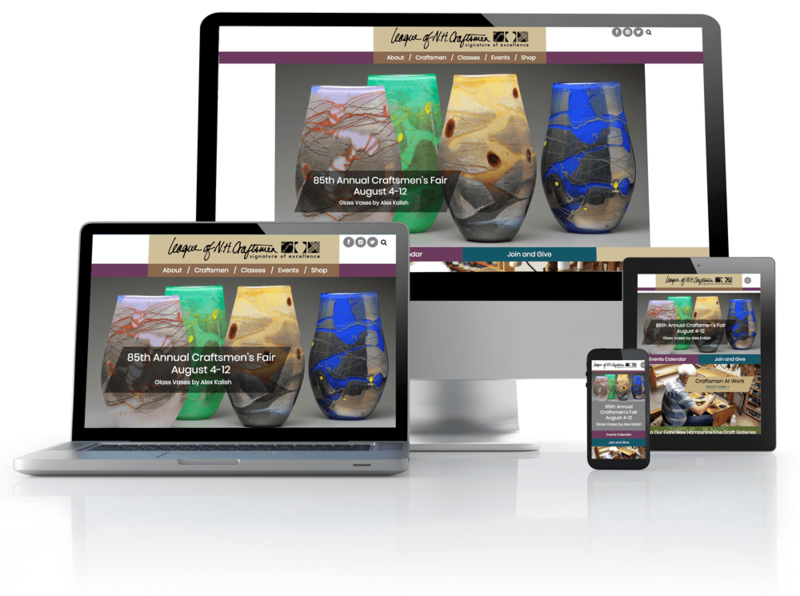 We created custom post-types that display Juried Members by name and media. This same solution was used to create a virtual display of all the items in the Grodin Permanent Collection Museum that is at League headquarters. Lastly, we formulated solutions that would display the classes offered at League headquarters and allow for easy marketing of events and exhibitions going on across all the galleries.